The sun was shining, the Yankees were ahead during the seventh-inning stretch of their game against the Seattle Mariners and it seemed as if the day couldn't get any better. That's when the Yankees' public address announcer, Bob Sheppard, asked the 52,553 fans at Yankee Stadium to direct their attention to the owner's box behind home plate. 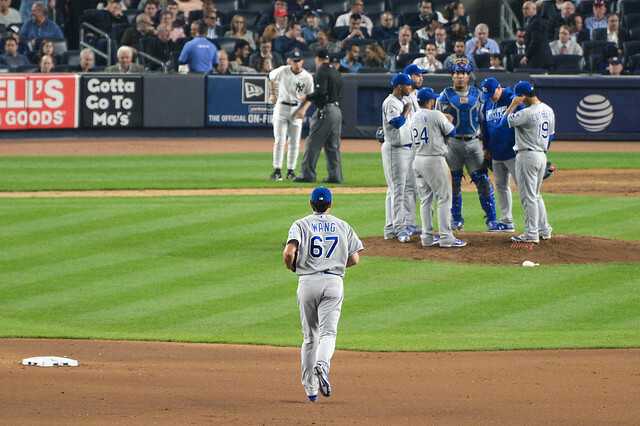 Roger Clemens was standing there, and suddenly the Yankees' season got a whole lot better. "It's a privilege to be back," Clemens told the crowd. "I'll be talking to you soon." And just like that, Clemens became a Yankee. Details of the deal were not immediately available. 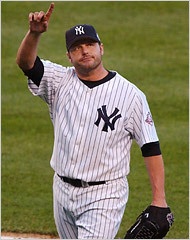 Clemens, a seven-time Cy Young Award winner, signed a minor league contract, the Yankees said in a press release. He is 44 years old. George Steinbrenner, the Yankees' principal owner, said in a statement: "As I pledged just a few years ago, I will do everything within my power to support Brian Cashman, Joe Torre and this team as we fight to bring a 27th championship back to New York. 洋基的大老闆George Steinbrenner在聲明稿中指出 : "就如我幾年前所言, 我將盡全力支持Brian Cashman、Joe Torre和球隊, 一同為紐約拿下第27座世界大賽獎盃。"
"Roger is a winner and a champion, and he is someone who can be counted on to help make this season one that all Yankees fans can be proud of. The sole mission of this organization is to win a world championship." Clemens pitched for the Yankees from 1999 to 2003. 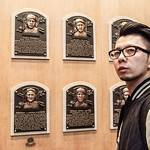 His career record is 348-173 with a 3.10 earned run average and 4,604 strikeouts. He last pitched for the Houston Astros, when he went 7-6 with a 2.30 earned run average in 2006. Clemens, who was not available for immediate comment, joins a pitching staff that has been ravaged by injuries this season. Phil Hughes injured his hamstring Tuesday in Texas, and Jeff Karstens broke his right leg on April 28. Both players went on the disabled list, creating openings at the back of the rotation. Clemens's return had been rumored for weeks. But the Yankees gave no indication that his signing would be announced on Sunday.